Get your exploring pants on because The Flannery Brothers are taking you on a musical adventure that starts in your own backyard. The Flannery Brothers (real life brothers Mike and Dan Flannery with honorary brother Jonathan Merrifield) have won a swag of music awards, notably the John Lennon Award for Best Children’s Song in 2008 and have released four albums since they began performing, the latest of which is The New Explorers Club. They include amongst their influences Jonathan Richman, The Beach Boys, Harry Nilsson and the Muppets but you will also hear flashy Jerry Lee Lewis piano antics, touches of reggae and a distinctive rock’n’roll-but-slightly-restrained pace that I associate with Ritchie Valens. Overall the sound is crisp and catchy. Pirate or Parrot? is the track that is being talked about in kindie music circles and it is fun (see the clip below) however don’t be distracted by this little sea shanty because there are other listening gems on The New Explorers Club. For me, the stand-outs are the ‘yucky and gross’ Swallowed a Bug which puts the lyrics “I swallowed a bug, It was totally worth it, It was sunny outside, The day was perfect” to a groovy boogie-woogie sound. I also love the neat harmonies and catchy melodies in Green Submarine and The Elements, both songs that show-off the Flannery Brothers’ style perfectly. 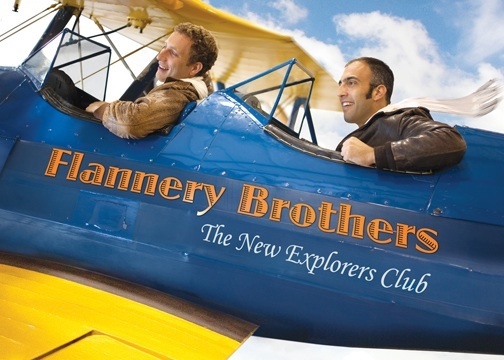 The New Explorers Club is available on iTunes for $16.99 or directly through the Flannery Brothers online store.